Town Hall Seattle and Phinney Neighborhood Association present the Johnaye Kendrick Quartet on Saturday, January 13, 11am, at Phinney Center (6532 Phinney Ave N). 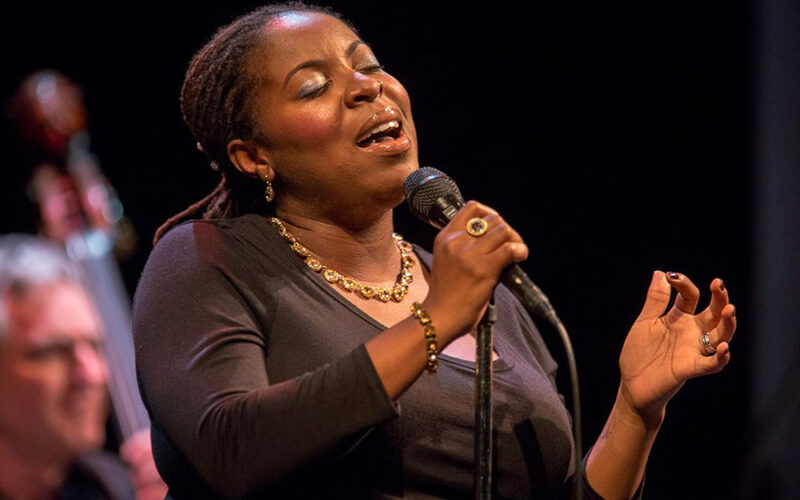 Part of Town Hall’s Saturday Family Concert series, the event features vocalist/composer Kendrick accompanied by pianist Dawn Clement, bassist Chris Symer, and drummer D’Vonne Lewis. The all-ages concert series is free for children (13 and under) and is $5 for adults. More information available at townhallseattle.org. Applications are now open for Chamber Music America’s New Jazz Works program. The New Jazz Works program provides grants to U.S. jazz ensembles to create, perform, and, if desired, record new works. The new work may be composed by the ensemble leader or another member of the ensemble. Applications are due February 4, and are available at chamber-music.org. Earshot Jazz seeks applicants for part- and full-time support staff positions. Compensation is $15/hour. A small non-profit, Earshot Jazz is run by two full-time staff; therefore, prospective employees must be flexible, with a strong work ethic, positive attitude, and passion for the work we do. Interested candidates should e-mail their resume and brief letter of interest to karen@earshot.org. Seattle Women’s Jazz Orchestra presents its 2018 Girls Jazz Band program, running January 10 through March 21. The program, aimed at Seattle girl jazz musicians ages 12 and up, offers eight evening rehearsals and culminates in a final concert. SWOJO’s professional musicians and music educators will lead rehearsals and sectionals, give a master class, and perform a joint concert on March 21. More information and registration available at swojo.org. The Earshot Jazz magazine reflects and shares the many ways that jazz intersects with lives in the Northwest. Earshot Jazz is seeking submissions from writers: e-mail story pitches, comments, news and announcements to editor@earshot.org. Dr. Lonnie Smith, Snarky Puppy, Terri Lyne Carrington, Ravi Coltrane, Esperanza Spalding, Scott Amendola, Kurt Elling, Regina Carter, Edna Vazquez, David Sánchez, Luciana Souza & The Dave King Trio, and more. Info at pdxjazz.com. Joey DeFrancesco, Terell Stafford, Tanya Darby, Antonio Hart, Kate Skinner, Brianna Thomas, and more. Info at 208-885-5900 or uidaho.edu/jazzfest.